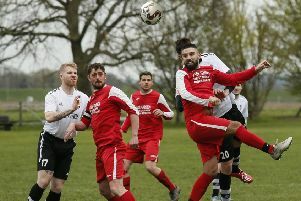 Renhold United relinquished their hold on the Bedfordshire League title on Saturday - with Oakley in pole position to win the trophy. United’s faint hopes of retaining their Premier Division supported by Sportsform crown ended after a 5-1 defeat at Cranfield United on Saturday. Martin Holland with a hat-trick, plus strikes from Nathan Evans and Jordan Appleton, brought up the home nap hand against a lone reply from Jason Allison. The league title is now between current leaders AFC Oakley M&DH and third place Wilstead. With the latter sitting the afternoon out the boys from Oakley took their unbeaten home ways up to 11 games in beating Ickwell & Old Warden 3-0 and now, with just two games to go, hold a five point lead over Wilstead who have the three games left to play. Matt Barnes, Dan Kelly and an Ali Smith penalty did the damage to see off Ickwell & Old Warden. Elsewhere over at Hillgrounds AFC Kempston Town & Bedford College’s quest for a top four finish was enhanced with a 3-2 home win over Shefford Town & Campton, Colby Smith netting twice and Chris Allen once against replies via Jamie Osbourn and Jahrome Mullings. But staying in the mix for a top four finish are both Flitwick Town and Marston Shelton Rovers who shared the spoils at the Football Centre from a 3-3 draw. Josh Reynolds, Dylan Codger and Callum Jones were on the home scoresheet against Rovers replies via Jamie Cerminara, Jim Burraway and Nicky Barton to extend Rovers’ unbeaten away run to six games. Meantime Ampthill Town know they will finish the season in eighth spot after being held to a 1-1 home draw by Sharnbrook. Alan Henman was on their scoresheet against one in reply from Jim Burnside whose side were thankful to goalkeeper Tommy Dove saving a penalty to earn them a share of the spoils. Down at the other end there was an all important 1-0 home win for Sandy over local rivals Caldecote. Jack Webb scored the vital goal in the 62nd minute in a game that was held up for some 12 minutes in the opening half due to a serious injury to Sandy’s Matthew Clark. The visitors had to play the last 10 minutes a player short following a red card for skipper Tom Wallace, his third of the season. With league leaders Sundon Park Rangers sitting the afternoon out second place Stevington took full advantage to close the gap on them to just two points. Their winning run is now seven games with a 3-1 success at AFC Kempston Town & Bedford College Reserves who were losing for the first time in seven outings. Aaron Hewitt scored twice and James Bourke once against a lone home reply from Keegan Roberts. Queens Park Crescents now know only Westoning can deny them a third place finish after they took their unbeaten home run up to six games with a 9-1 victory over Ickleford who were slipping to their seventh consecutive league defeat. Ayaz Hussain with a brace was joined on the scoresheet by single strikes from Daniel Rasol, Danyaal Iqbal, Meharban Hussain, Mohhammed Assass, Myles Ferraro and Shazed Sattar against a lone reply from Gareth Head. However for Westoning to catch the Crescent boys and land that third place finish they need to collect 12 points or more from their remaining six games after running out 5-1 home winners over Potton Town thanks to goals from Dominic Benmoussa, Sam Holmes plus the Cooksley boys Thomas, Rob and Shaun against a lone reply from Sam King. Bottom of the table AFC Oakley M&DH Reserves failed to raise a side to visit Houghton Athletic who were duly gifted the three points to now take them six points clear of the M&DH boys who still have another three games to collect the points to overhaul them. Whilst Shefford Town & Campton Reserves climbed into ninth spot with a 3-0 home win over Henlow to record their first win in five outings. With 55 minutes played and the scoreline at 0-0 Town, due to an injury and no substitutes to call on, were forced to play the last 35 minutes with just 10 players but it mattered little as two goals from Simon Castle and a single strike from Adam Spoors saw them home to the three points. Now back onto the top of Division Two are Cople & Bedford SA who took their winning ways up to six games to climb above Clapham Sports for whom after 12 straight wins it became unlucky number 13 has they went down to a 7-1 defeat. Ollie Hughes led the way with a hat-trick, Paul Nigro added a brace and they were joined on the SA scoresheet by single strikes from Daniel Lupton and Brett Allen against a lone Sportsmen reply via Grant Williams. Down at the other end of the standings Marston Shelton Rovers Reserves exchanged second from bottom and third from bottom spots with Kempston Athletic after they ended a seven game losing home run with a 6-3 victory over them. Gary Russon scored twice alongside single strikes from Ryan Maddock, Dale Maicaw, Ross Milton and Alex Wallace for the Rovers against Athletic replies via Niklay Mandinga twice and Richie Andrews once for the Athletic. Champions Wixams finished their season with a 100% home record after they netted a 4-3 win over third place Wilstead Reserves who now require all six points from their closing two games if they are to overhaul Sundon Park Rovers for the runners-up spot. Gareth White was the sole destroyer with all four goals to see his side to their eighth win on the bounce against replies via Hani Thiarra twice and Ryan Davenport once. Whilst fifth place AFC Dunton went down to a surprise 5-1 defeat at third from bottom of the table Meltis Albion Reserves. Scott Alleyne netting four times and Carl Townsend once for the Albion against a lone reply from Tony Norman. Elsewhere Clifton now know they will finish the season in bottom spot after losing 2-0 at Renhold United Reserves, for whom Michael France and Iain Asplin netted the goals to do the damage. Whilst Shefford Town & Campton A ended their season with a 4-1 home defeat at the hands of White Eagles. Kazimierz Orzecikswski, Michal Michalski and Sebastian Perczyk were joined on the Eagles scoresheet by an own goal from Marcus Rose against a lone Town reply at the correct end from Dean Lindsell. Caldecote A now know they will have to win their last game of the season if they are to collect the division four silver medals after getting beaten 2-1 at Stevington Reserves who will now, after goals from Sam Nightingale and Jamie Endersby, finish the season in fourth spot. The lone Caldecote reply came from Oscar Smith.